The Portuguese capital of Lisbon has a faded grace that is utterly enchanting. In the old city’s steep, narrow streets, once grand buildings display worn facades, battered shutters, and laundry hanging from the balcony. Tailors and cobblers ply their services from tiny, bedraggled shops, while the baked-sugar smell of custard and caramel wafts out the doors of ancient pastelarias. And up every steeply sloping street in this hilly city, it seems, labors a groaning trolley car, while far below glitters the River Tejo. Portugal’s capital—home to half a million people—is a gracious city, yet also one with an odd, pensive gravity: a world-weariness born perhaps of great age and of empires gained and lost. It’s also an amazingly inexpensive place: arguably the most affordable capital in Western Europe. A couple could live comfortably here for as little as $2,100 a month. If you’re budget-conscious, take heart. 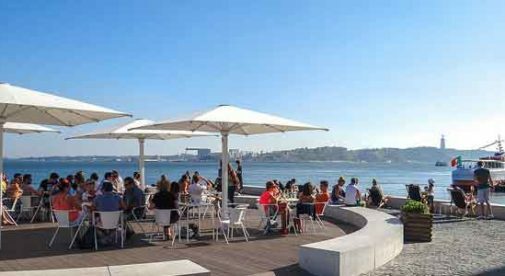 Lisbon is a place where you can enjoy a European lifestyle at Latin American prices, with history, romance, astonishing hospitality, and a seaside location to boot. Daily living expenses in Lisbon are generally low and the climate is mild, keeping utility costs down. In many Lisbon neighborhoods, you can still rent a smart, comfortable one- or two-bedroom apartment for $580 to $800 a month. You can buy it for under $200,000 and even find some under $150,000. Daily living expenses are generally low, too: an espresso for under $1, filling sandwiches from about $6, and produce often less than $1 a pound. Even the weather helps. 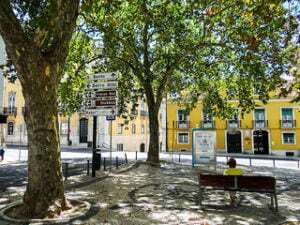 Lisbon’s climate is mild, keeping utility costs down. Even in the depths of often-rainy winter, average lows are barely below 50 F, while summers are gloriously sunny and generally in the 70s F.
You’re not likely to have language problems here, either. I was astonished at how many Portuguese in Lisbon speak English well. In addition to studying it, they get it on TV: Films and programs in Portugal tend to be broadcast in their original language, with Portuguese subtitles. So those movie channels? In English. Speak a little Spanish? It’s a good fallback option here. Many Portuguese speak it and most understand it fairly well. And where language fails, the locals’ natural courtesy helps bridge the gap. The Portuguese are among the most polite, friendly people I’ve ever met. They alone are a great reason to check out Lisbon. Romance, culture and adventure awaits in Portugal. Learn more about Portugal and other European countries in our daily postcard e-letter. Simply enter your email address below and we’ll send you a FREE REPORT – Portugal: The Jewel of Southwest Europe. This special guide covers real estate, retirement and more in Portugal and is yours free when you sign up for our IL postcards below.